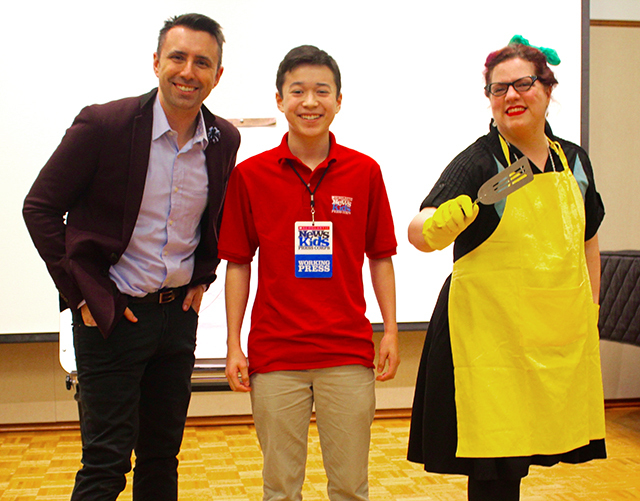 A Visit With Lunch Lady—and Her Creator | Kid Reporters' Notebook | Scholastic Inc.
Maxwell visits with author and illustrator Jarrett J. Krosoczka and “Lunch Lady” at the Public Library of Brookline in Massachusetts. Author and illustrator Jarrett J. Krosoczka has focused much of his career on graphic novels, a format that he finds inviting for all kids, especially struggling readers. Growing up, Krosoczka loved to draw. Raised by his grandparents in Worcester, Massachusetts, he graduated from the Rhode Island School of Design. Soon afterwards, he created Lunch Lady (Knopf Books for Young Readers), a graphic novel book series that is a runaway hit with kids. “After learning that my childhood lunch lady had grandkids and therefore a life outside of the lunch line, I began to daydream about the secret lives that lunch ladies might lead,” Krosoczka said. His imaginary character came to life as a cafeteria worker who morphs into a crime-fighting superhero, keeping the school safe from nefarious villians. Krosoczka also writes and illustrates the Jedi Academy series for Scholastic. He is currently working on the sixth book, Jedi Academy: The Principal Strikes Back, which is due out in July. What were you like as a kid? Did you enjoy reading? I was a shy and introverted kid who read a lot of comics. I didn’t think I was much of a reader when I was young, but that’s only because adults didn’t validate that kind of reading back then. I was reading comic strips in the newspaper every single day, and I was also making monthly trips to the comic book shop. If I wasn’t able to get a ride to that comic book shop, I would walk. It was a mile and a half each way. So not only was I reading, I was walking three miles to get more reading material. What are the most rewarding—and challenging—parts of your career? The most rewarding part is hearing from my readers. I love knowing that my work has connected with people. The most challenging part is getting all of the work finished on time. I typically have a few books in progress at the same time, so between that and my very busy family life with my three children, it gets crazy. I’m a sucker for peanut butter and chocolate in any shape or form.